In the third installment of this recently reactivated thread we follow on from the concept of Custom Law and Common Right, in relation to Wally Hope’s Stonehenge People’s Free Festival, and the Open Access to Stonehenge Campaign that it was eventually to spawn more than three decades after his death, with a look at the significance of Stonehenge as an actual physical repository of the lost science of Prehistoric Britain; as set out in its physical dimensions. In many ways, the fact that the builders of Stonehenge appear to have possessed an in depth knowledge of the Universal Canon of Number and Measure that the builders of the Pyramids of Egypt, and many other similarly ancient monuments across much of what is generally referred to as ‘the Old World’, and beyond, can also be proven to have been familiar with, is perhaps a key factor in the decision by English Heritage, and the various other vested interests linked to the sorry saga of the Free Festival and its suppression, to restrict non-commercial tourist based access to the Stones as far as is humanly possible. In recent years such ideas have been more openly discussed in the wider community in relation to a similar Canon of number and measure incorporated into the dimensions of Rosslyn Chapel in Scotland; as a result of the run away success of Dan Brown’s celebrated novel ‘The Da Vinci Code’; and its equally successful cinema adaptation starring Tom Hanks in the lead role. At the heart of the plot line in both novel and film, as well as the series of pseudo-historical books by Baigent, Lincoln and Leigh that are believed by many to have influenced them, lies the significance of such ideas to elite fraternities within the Power Structure, people like Opus Dei and the Freemasons, who claim to possess the hidden keys of cipher and symbol, at the heart of such ancient knowledge, as a key element within their own secret and closely guarded hidden esoteric teachings. ‘The dimensions of the great circle of Stonehenge, the temple of prehistoric Wessex, provide a monumental record of the standards of measure used by its builders and of the lengths they attributed to the Earth’s dimensions’. During the course of the same treatise, much reference is made to an earlier published work by the same author entitled ‘City of Revelation’, that preceded it by some several years, in which the geometry of the monument is also looked at in some considerable depth. 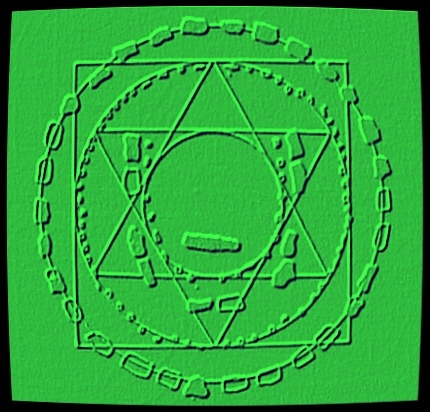 Interestingly enough, amongst the two dimensional Plane Geometric figures that Michell superimposes over a ground plan of the Monument during the course of the latter work is the regular Hexagram, or ‘Star of David’, a symbol widely used by Illuminists, Freemasons, and other secret societies, throughout a wide variety of overt and covert applications. Was this the key to Wally Hope’s unfortunate and premature demise? And, if so, was he some sort of masonic martyr, sacrificed on the altar of their quasi-religious doctrines as a means of keeping knowledge of the Monument’s hidden significance out of the consciousness of the mainstream? Whatever the real truth in relation to the last posed question, it is fact that both English Heritage, the Police and every other vested interest linked to the death of Wally Hope and the subsequent demise of the Free Festival, was in some way linked to the hydra of masonic influences that permeate the upper echelons of the Power Structure at every conceivable level. In a future installment of this ongoing thread we shall examine these ideas in more depth. This entry was posted in Responses to the New Putney Debates and tagged Ancient Order of Druids, Custom Law and Common Right, Da Vinci Code, Free Access to Stonehenge Campaign, Freemasons, Illuminati, Stonehenge, Stonehenge People's Free Festival, Wally Hope. Bookmark the permalink.